For many of our senior and elderly loved ones, the television is their link to the outside world. TV’s are often their primary source of news, information, and entertainment. Unfortunately, the complications of aging can chip away at the usefulness of this important technology. For example, complicated remotes can make TVs difficult to operate. Poor vision leads to the need for a larger TV perhaps. Most commonly though, the loss of hearing leads to missed dialogue which leads to loss of enjoyment or misunderstood information. So, the TV volume just keeps getting turned up louder and louder. To help these folks, I’ve created this guide to the best tv listening devices to help improve senior’s ability to clearly hear their television. There are many more devices to help this problem than you probably realize. So many that it can get confusing quickly. Here are my overall favorites. Keep on scrolling to learn more about these and other options. Images, Ratings, & Prices from Amazon Product Advertising API - Updated on 2019-04-22 at 20:16 - contains affiliate links (see footer). The good news (and bad news) is that you have lots of device choices for improving sound quality and volume while watching TV or watching movies at home. There are a few major classifications to learn about that will help you make your decision. Here is a rundown of the options out there with a few product recommendations for each one. The first option we should talk about is the amplified TV speakers. This includes amplified speakers that plug into the TV including sound bars. The speakers may be located near the TV but are usually positioned near the user’s ears. RCA Jacks are the most common audio out connection. There are several positives of choosing a speaker system. Portability. These devices are easy to move around for the best TV listening experience. They are small and lightweight and can easily follow you if you decide to sit in a different chair. Traveling? Take them with you wherever you go. Most are small enough to fit in a suitcase. Compatibility. Portable TV speakers will generally connect to nearly any TV audio outputs: headphone jacks, RCA jacks, and optical outputs included. Wireless. Many of these models have no wires between the transmitter and the receiver. So, no wires to manage or trip over. Easy to Set-up and Use. Just plug the cables into the outputs of your TV, make sure the battery is charged, then use a simple knob to adjust the volume. That’s really all you have to do to use a system like this. Hearing Aids. Because they are external, these TV listening aids can be used with hearing aids. The Optical Audio Out port is a digital fiber optic connector on newer TV’s. If the speaker is turned up loud enough, it could disturb others in the room or elsewhere in the house. Several models come with headphone jacks because of this. Because they are wireless, most are battery powered. So, it is important to make sure the batteries stay charged or have a power adapter for the speaker part also. That way, the speakers will always have power when the senior wants to use them. Here are my recommended TV speakers for seniors who are hearing impaired. This is a great choice for a wireless TV speaker when simplicity is what you are looking for. This model is about as plug and play as you can get. It comes with several connectors that will work with the headphone jack or the RCA outputs on the TV. Simply, plug the connector of your choice into the TV then adjust the volume with the large knob on the side. This one reminds me of the old radio my grandfather kept in his garage. Just a basic black box with 2 speakers. There is nothing intimidating about it because it has a look that is familiar to most seniors. It is also one of the smaller units. The box itself is 8.5” wide by 8” high and less than 3” thick and weighs about a pound. This size makes it easy to move from room to room throughout the house and small enough to pack in a suitcase or overnight bag. 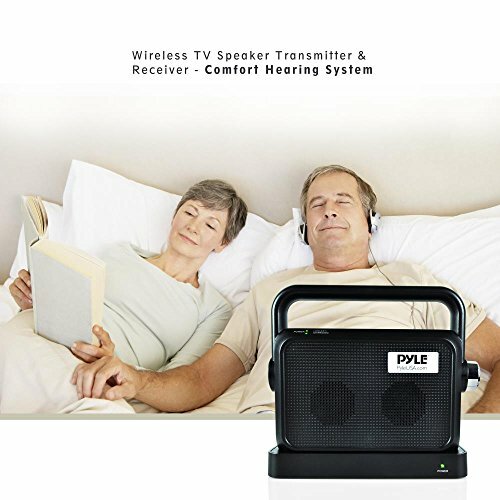 The Pyle Portable TV Soundbox uses radio frequency (2.4GHz) to transmit the signal to the speaker. This gives it an extra-long range (up to 100 feet) similar to wireless wifi routers. So, it can be carried from room to room if needed to continue a show or to keep listening to the news while going to the kitchen. The transmitter plugs into an AC wall outlet and it doubles as a charger for the speaker. Simply, place the speaker on the base and it automatically begins charging. Users have reported a long battery life of this product (up to 12 hours). But, the speaker itself does not come with a power adaptor. If someone wants to keep it plugged in all the time, there is a place for one and you can order one separately if needed. If not, the user should get in the habit of placing it on the charger when finished using it. If mobility makes this difficult, grab the extra adaptor. Finally, if there are others in the home who may be disturbed by a loud speaker, there is a headphone jack on the speaker for private listening. Unit requires to be charged for 6 straight hours prior to first power up. 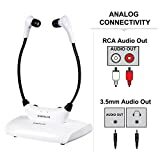 Images, Ratings, & Prices from Amazon Product Advertising API - Updated on 2019-04-22 at 18:24 - contains affiliate links (see footer). While the unit by Pyle above is good, I like this one from Simolio a little bit better. Mainly, because it is a complete set and includes all the accessories you may need. Like the model above, it comes with the connection cords you may need. But, a bit of a warning. You need to know the connection type before ordering. The analog model works with RCA jacks and there is also a digital model that connects to the Optical audio port. Most TVs have the RCA connectors FYI. Once you have the transmitter connected to the TV is also doubles as the charger for the speaker. The manufacturer reports battery life of up to 6 hours. But, it also comes with a separate power adapter for the speaker. That way, it will always have power and you’ll never have to wait for the batteries to charge. This one is simple too. There is a large, well-placed knob on the front. Simply turn the knob to adjust the volume. The same knob turns the unit on and off. 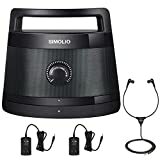 The Simolio TV listening device has a headphone jack on the speaker and even comes with a set of “stethoscope” style headphones for the user. No more disturbing others in the home with a super loud TV volume. This is a great option for people who have trouble sleeping and watch TV late into the night. This unit is also highly portable with a handle on the top. It uses the same transmission frequency as the Pyle (2.4 GHz) and the same range of about 100 feet. But, it is heavier than the Pyle coming in at over 2 pounds and larger overall too. It measures in at 11” wide by 9.6” high and almost 5” deep. Simolio uses several different technologies to boost the clarity of dialog. This makes the dialog stand out from background music and sound effects. There is a small switch on the back of the unit to customize this by selecting a low, mid, or high setting. Soundbars are those long, rectangular speakers you see under some TV’s. TV audiophiles use then to boost the sound that comes from a regular television set. These have some use for seniors with hearing difficulties too. The major drawback is that soundbars are not portable and typically sit under, on, or next to the TV. 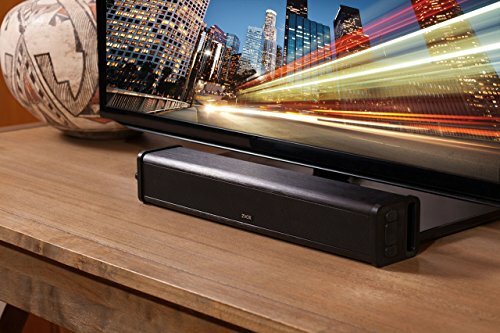 The Zvox AccuVoice soundbar looks like normal, standard audio equipment. So, it may be a great choice for anyone who is sensitive to having using special devices out of pride or embarrassment. It is easy to set up and to use too. 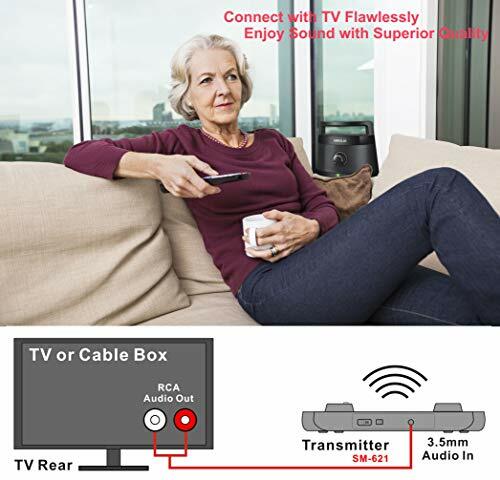 Simply connect the power cord and the audio cable between the TV and the soundbox. Note, however, that you must have an Optical audio out on your TV for this to work. The volume can be adjusted with the included remote control or most cable and satellite remotes can be programmed to control it. The biggest plus for the Zvox is that it has an exclusive technology that makes voices stand out so they can be heard better. It does this by separating the voice track from the background music then boosts the voices to they are clear and easier to understand. It is not portable though. It has to stay plugged into the TV. Most people sit them on their TV stand under the TV. It measures 17” wide by about 3” high and 3” deep. Weight isn’t really a factor but it weighs about 3 lbs. One other cool feature is the Output Leveling technology. Have you ever been blasted by a loud commercial? This feature levels the sound out so that the volume is consistent. The next group of TV listening aids are the headphone styles. These devices use headphones that sit on the ear or over the ear completely. Earbuds, which sit inside the ear canal, are also part of this group. These devices have a transmitter that plugs into the audio out ports of the TV. Then, it sends the sound wirelessly to the headphones. The user then wears them and is able to enjoy better sound because they are close to the ears. Private Listening. The user can listen to the TV at a different volume than others in the room. All they have to do is turn the volume on the headphones up and leave the TV at normal volume – or off altogether. Portability. These devices are small, lightweight, and easy to take with you. They can even be worn around the house to listen to the TV while doing other tasks. Most will have a range of nearly 100 feet (check each model specifically). Compatibility. 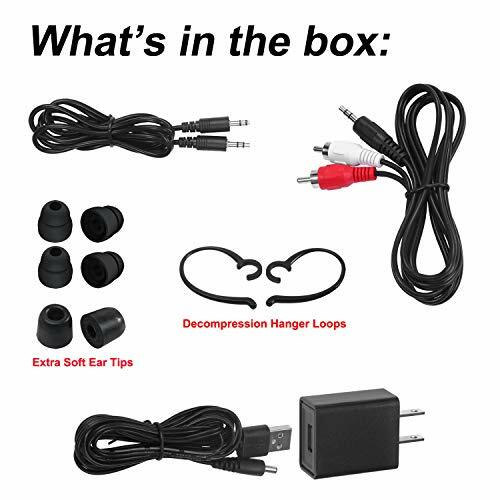 Many of the headphone sets use standard audio connections and will work with most any TV. Easy to Set Up and Use. These are also “plug and play” meaning all you have to do is plug them in, charge them up, and they are ready to use. There are no settings or pairing needed. Wireless. Although there are still a few wired models around, most of these types of products are now wireless. Hearing Aids. Because these devices fit close to or inside of the ear, they usually cannot be used with hearing aids. ONE MODEL is the exception to this rule and claims to be hearing aid compatible. Because the sound is playing so close to the ear, the wearer may not be able to hear telephones or doorbells while using the device. Phone ringers may need to be turned up. Headphones come in three basic styles. The first is the over the ear style which has soft cups that completely cover the ears. The second are called “on the ear” and these sit just over the ear opening and usually have a soft pad on them. The last style are earbuds. Most of the earbuds for TV listening are “stethoscope” style meaning they sit just in the ear canal with a holder that sits below the head – just like the stethoscopes at the doctor’s office. Because they sit in the ear, these are not hearing aid compatible. 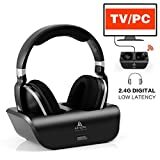 For a good basic set of headphones for watching TV or even listening to music, I recommend these headphones from Artiste. They are the over the ear style which are sometimes more comfortable to wear. Keep in mind the drawbacks though that I discussed above. Like most of the products I’ve reviewed here, these are easy to set up. Just plug into your audio out (RCA jack or headphone jack), charge them up all the way, and then put them on. The band is adjustable to customize the fit. They also work with computers, MP3 players, cell phones and iPads too. Speaking of charging, the transmitter that plugs into the TV doubles as the charging station. When the user is done using them, they simply set them back in the base so that they will be charged for next use. They also use radio frequency for transmission and have a range of up to 100 feet. One potential drawback is that the TV volume must be adjusted with the TV remote. These headphones do not have their own individual volume control. Because of these, they are probably best for seniors who watch TV alone. They are also not hearing aid compatible and will cause ringing and squealing if worn with them. If you need a model to work with your hearing aids, keep scrolling. 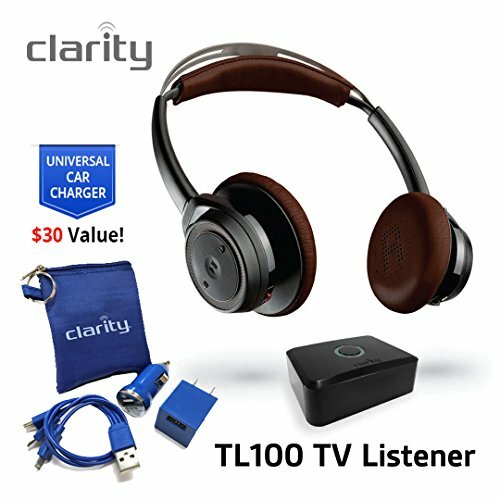 If you need a set of headphones for your TV that are hearing aid compatible, I like these by Clarity. Users report that these lightweight headphones are comfortable to wear and easy to use. These sit just on the surface of the ear so they are less likely to block other sounds like the phone ringing or the doorbell. These work via Bluetooth connection. If your TV is not Bluetooth equipped, this model comes with a transmitter you can plug into the TV using RCA jacks or a headphone cable. You can also sync these headphones with 2 devices at the same time. So, you could also sync them with a cell phone so that calls will ring into the headphones while watching TV. This could prevent missed calls! The headphones themselves have rechargeable batteries and the unit comes with 2 sets of power cords. One is for the base and the other is for the headphone. There is no charging dock like the other models. It has to be plugged in. I also like the OpenMic function. This is a button on the side of the headphones that you can press to mute the headphones. It allows the user to hear what’s going on around them without having to take the headrests all the way off. The volume can also be controlled by a knob on the left earpiece for quick volume adjustments. OpenMic button lets you hear your surroundings without removing headphones. You may have seen the TV Ears commercials on late night TV in the past. These TV listening earphones are made specifically for improving TV hearing. They use a proprietary Voice Clarifying Circuitry that adjusts itself to make dialog easier to hear and understand. It also decreases the volume of loud background noise. TV Ears are probably the best headphones for people with pacemakers. These use infrared (IR) technology which is safer than radio frequency (RF) for pacemakers. There are some drawbacks to IR though. The range is less meaning you can’t go as far away from the TV. You will also need to stay within the line of sight of the transmitter. These are simple to set-up and use. 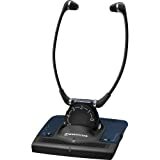 This model comes with both analog and digital audio cords so you can use a wide range of connections for it. Like most of the others, simply plug it in, charge the headphones, and turn it on. It’s that easy. Volume can be adjusted right on the headphones too. Reviews are somewhat mixed though. People either seem to love them or hate them. There are multiple complaints about them breaking so I wouldn’t use them with anyone who is rough on their equipment. So, why did I include them on this list? Because they have been so heavily advertised that people ask about them. I also wanted to include an option for seniors with pacemakers. A less costly option that is a little better rated by the buyers at Amazon are these headphones by Similio. They are similar in styling to the TV Ears in that they are in-ear stethoscope headphones. Set-up for these is easy too. One small note: be sure you know how you are going to connect these before ordering. This is because you have to order an analog or digital model. Analog is for headphone jack or RCA jack connections. Digital is for the Optical audio out connection. But, as long as you order the correct item, this is a plug and play type of item. No syncing or pairing is required. These headphones are wireless and the signal is transmitted via RF (radio frequency) which gives the best range. The range on these is about 100 feet away from the base. That’s enough of a range for them to work in the next room or in large rooms too. The headset is powered by a rechargeable Li-ion battery. To charge the battery, simply place the headset on top of the base and it will go into charging mode. They will last about 7 hours with continual use. Another cool feature of these headphones is they have a MIC button that allows them to be used as a Personal Sound Amplifier (PSA). This allows the user to use the headphones to amplify conversations in the room and other ambient sounds. Volume and mute are controlled through the headphones and TV can be enjoyed with others or alone. Ok, for those who want a higher end solution and can afford the very best, these Sennheiser headphones are probably the best out there. You will pay more for this unit but there are tons of raving fans online about this item. It has many of the features that I like in the other items. It is easy to set-up and is plug and play. The headphones are wireless and are charged by placing them in the base. They have a range of up to 100 feet and the signal is transmitted by RF. Also, they use the usual connection methods. There are a few areas where the Sennheiser stands out specifically. First, you can custom tune the amplifier with three selectable hearing settings that are designed to optimize conversation and speech from the TV audio. This helps fine tune them so they work better for you. The headphones themselves are very lightweight and extremely comfortable to wear. They have these flexible ear pads that move with you and keep them from cutting into the ear. The controls are located right on the headset too for easy volume control. There aren’t many drawbacks to these except that they will not work with hearing aids because they sit in the ear. And, like I said before, they are one of the higher priced solutions. There is also another class of devices that are specially made to improve TV listening for hearing aid users. These have transmitters that send the sound right to the user’s hearing aids. Some examples are loop transmitters that work with T-coil hearing aids. There are other devices made by the hearing aid manufacturers that work with their brand of hearing aid only. Contact your hearing aid company for more information. Sometimes, though, the TV itself must be replaced because it is not loud enough or not adaptable to these newer technologies. It might not have the right audio ports or be able to be upgraded to work with your favorite device. If you decide to upgrade your television, look for one that has equalizer functions in the settings or special audio modes that boost conversation and dialog. It would also be advisable to get one with multiple audio out ports. The minimum ones should be RCA jacks (red, white, and yellow circle connectors), a headphone jack, and Optical audio out. These should give you plenty of options for adding additional TV listening devices later if you need them. To find the best TV listening device or you or a loved one, there are several considerations. Here are some important factors to consider. How Will the Device Be Powered? One of the most important things to think about is how the device will be powered. Will it plug into the wall outlet or use a battery? AC powered (plug in) models will require a plug near the location where the user will be watching TV. The benefit of this style is that the unit will always have power. But, a drawback could be the wires. It is important to make sure any wires are out of the way to prevent tripping over them. Battery powered devices are sometimes more convenient but, of course, require either battery changes or the batteries must be recharged frequently. Make sure you know the battery life of the listening aid you choose. If it is being used by an elderly person or senior who isn’t up with the latest technology, they will need to be shown how to change or charge the batteries. They also need to when it is time to charge the batteries by understanding the warning or charging indicator. Will It Be Compatible With Your TV? Most TV listening aids will plug into the audio outputs of the TV. Check to what types of outputs you have and where they are located. The most common types are RCA plugs and Optical outputs. RCA jacks are round plugs with red or white insets in them. One plug represents the left channel and one represents the right on a stereo setup. The plugs that fit into these connections have single prong with a metal ring on the outside. Optical outputs are on newer TVs and uses fiber optics to send audio signals to the device. The plug has a small square end on it. The location is important too. The best location for access is on the front or side of a TV sitting on a cabinet. Wall mounted TVs may be challenging because the ports cannot be reached. Or, there may no place to set the transmitter once it is plugged into the TV. The newest TV sets may have built-in Bluetooth and not require any cables at all. Although, Bluetooth has its own challenges that we will talk about in more detail later. For older TVs with no audio outputs, some listening devices have mics with them that you can set in front of the TV speakers. How Will The Device Transmit the Signal? Like I talked about above, most TV listening devices require a transmitter that plugs into the audio out ports. This box transmits or send the audio signal to a receiver that plays the sound. This transmission can be sent via a wire, an infrared signal, a radio frequency, or Bluetooth. A wired connection may produce the best quality sound but will be far from convenient. You would need a wire running from the TV to the speakers or headphones. This could cause someone to trip over the wire. So, most devices today have wireless connections. Radio frequency (RF) has a longer range which means you can use it farther from the TV. Sometimes even in a different room. This style uses radio waves to send the sound signal. These signals work anywhere within the room and even penetrate walls depending on how powerful they are. Most of the devices today are RF. However, most manufacturers don’t recommend you use radio frequency headphones if you have a pacemaker. People with pacemakers should use Infrared (IR) or Bluetooth. Infrared (IR) is what your TV remote uses to change the channel or volume of your current TV. The range (how far away you can get) is usually somewhat limited. The receiver must also be in the “line of sight” of the transmitter. This means you must be able to draw an invisible line between the two for it to work. Think about your remote control. If you point it behind you, it will not work. You have to point it right at the TV. Finally, Bluetooth connections are becoming more and more popular. The advantage to Bluetooth is that it can connect with no wires. The Bluetooth transmitter is built into the TV itself. A huge drawback though is that Bluetooth signals have a very short range. Therefore, the user must stay close to the TV to receive the signal. Of course, sound quality is extremely important. I mean, that is the whole reason you are doing this right? The good news is most of these devices have good sound quality out of the box. Many have special built-in processors that separate speech and amplify it over other sounds. This is important because the frequencies of human speech are the ones that need the most amplification. How Important is the Unit’s Design? Do you care how the device looks in your home or when you are wearing it? Some of these devices use speakers that sit on the back of a chair or near the user’s ears. Many of the headphone styles are worn over top of the ears like Princess Leia buns. Others look like a stethoscope hanging around the neck. Some people are bothered by things like this. Just take that into consideration especially if buying a system for someone else. Do you need to move the device from room to room in the home? How about travel? Do you want to take it with you when vacationing or visiting family? If so, choose a device with a simple plug connection and plug and play set up. The smaller the overall size the better too. Will Others Use the TV at the Same Time? This may be a bigger deal than you think. And, here’s why. Many TV’s only play the sound through the “active” output which is usually the built-in speakers. So, when you plug anything into the audio out ports, it may shut off the speakers and only play through the added device. That means no one else can hear the TV. Is the device plug and play meaning all you have to do is plug it in and maybe adjust the volume controls? Or, does it require syncing with another device or a complicated set-up process? These are important considerations, especially for non-techy seniors. Is someone in the family available to help set it up? Can someone assist with troubleshooting if necessary? Many devices do have quick start guides and customer service phone numbers, but a base level of tech know-how may be needed. Is the TV Listening Device Easy to Use? Is the device easy to use? Make sure any buttons or controls are clearly labeled. You should be able to understand how to use the device without having to read a manual. The optimal choice is probably one with a simple volume adjustment wheel or switch. Is Your Choice Hearing Aid Compatible? Does the user wear hearing aids? This may eliminate some choices from consideration. For example, wireless earbuds will not fit in the ear with hearing aids. On the other hand, many hearing aid manufacturers make TV listening aids that work with their hearing aids. That way, the sound from the TV will play right through the hearing aids. These are often brand specific though and you will have to buy the one that works with your brand. What is the Return Policy and the Warranty? Whether you buy your TV listening device at a retail store or online, know the return policy before buying it. It is also important to know what the warranty is too in case of a problem. Can you return the device during the warranty period or will it need to be sent in for service? There are a few tweaks you can try first before buying any new gadgets. These are especially helpful for those in the early stages of hearing loss. Closed Captioning. Turn on the closed caption capabilities of your television. Almost every TV out there has this capability built-in. You can find it in the TV settings menu. Sometimes, this is enough to supplement the dialog if you are missing a few words here and there. Adjust EQ Settings. Some TV’s have equalizer settings that allow you to tweak the levels of the TV sound. To improve the quality of dialog, turn down the bass level and turn up the mid and treble levels. You’ll probably have to play with these settings to find the best levels for you. Put Your TV in a Corner. Move the TV to the corner of the room. This will allow the TV to use the walls as amplifiers which will bounce back the sound towards the watcher. It’s a similar effect to putting your hand behind your cell phone speakers to boost the sound. This is especially helpful when the speakers are on the backside of the TV. So, here is a quick review of all this information. 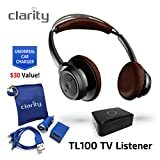 There are many devices to choose from that will help you hear your TV better. Most are easy to set up and usually plug right into the TV. Many of them are also easy to use although some are easier than others. Separate TV speakers including sound bars are best for seniors with hearing aids and who usually watch TV alone. These are available as wireless speakers that can sit right next to the user. Another version is soundbars that sit next to the TV set. Some come with headphone jacks that can be used when there are others listening to the TV at the same time. The other option is headphones that the user can wear to improve the sound. These are best when multiple users are watching TV or for more profound hearing loss. There are three headphone styles to think about: over the ear, on the ear, and “stethoscope” style. Each has its own advantages and disadvantages. These styles are not usually hearing aid compatible. Whew. Who knew there was so much to say about tv listening devices? I hope this guide has helped you decide which is the best for you and your situation. Feel free to ask any question in the comments below. Also, please share any tips you have for hearing the TV better!